The build sheet as we know it today in the collector car hobby, is a post world war invention. 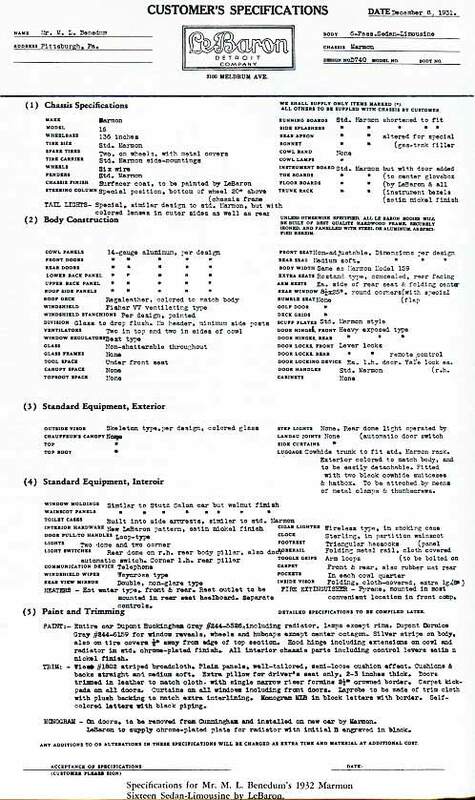 A product of the consumer age and early computers, build sheets from the 1960s and 1970s have a certain appearance and some uniform standards. The build sheet idea was around before the '50s however. We can trace the concept back to the coachbuilt era of the 1920s and '30s. Back then cars were toys for the very wealthy and the few who could afford to buy one also had them made to order. Several coach building firms such as Lebaron-Bonney, Brewster & Co., Locke or Derham developed a following of loyal customers who would hire them to design their latest purchases. Sometimes the buyer would leave it up to the coach builder to suggest a suitable chassis for the body but most often the chassis was purchased and sent to the coachbuilders. Most often these orders came from the dealerships of various luxury cars. The senior salesmen usually had a rapport between their clients and the coachbuilders and it was through this network that a custom body order would be completed. Another person of importance during this process was the chauffeur. This man was in charge of the regular maintenance and driving duties of the car. He had real world experience with the attributes of certain designs and drive trains and this usually affected the selection of chassis. A meeting with one or more custom builders was the next step, either at the coach builder's office or at the dealer show room. Scale drawings of proposed designs were made usually on a scale of 1 inch to one foot. Each design was given a number. Factory blue prints of the chassis were consulted to determine important factors such as axle kick up, location of steering wheel, and most important to the body builder: the D post. The D post was the angle of your steering column; the height of which determined how low cut you could design the cowl for a sporting look. The lower the angle of the steering column, the more rakish profile you could design for a sleek appearance which was desirable for a torpedo or boat tail speedster body. At the other end of the scale, Rolls Royce and American luxury models usually specified the highest angled steering column for long term driving comfort and this was called the 'A position.' The cut down, sporty jobs had a low raking steering column which was called 'D position' in the blueprints. Once the chassis dimensions were laid out, sketches for the interior and body were done to scale and were numbered for showing the customer. When the customer selected a design, that particular drawing was used for development. Any changes in specs were added and the sketch given a revision number. The sketches were handed over to the artist for a color rendering which is basically a brochure-like illustration of the car for the customer. 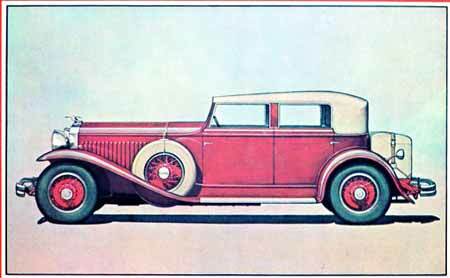 A 1930 Hispano Suiza Convertible Phaeton is shown in a LeBaron sales catalog. These renderings were done to show clients how their car would appear. R.L. Stickney handled the renderings for LeBaron and also illustrated color catalogs for Lincoln Motors. Once the renderings were seen and approved it was time to draw up a set of specifications for the body-build order. This is a complete list of chassis type, body construction, paint and trimming, interior, chassis, drivetrain and any extras specified by the customer as part of his order. It is a description of what his car should be when finished. The customer specifications sheet was matched with the chassis manufacturer's blue prints for the chassis and together they comprised the plans for making a custom order car. A customer specifications sheet listed all the details of the car's construction from chassis to body and interior. This along with draftsmen's drawings helped builders assemble the car to custom order. Draftsmen produced layouts of the body called the body draft. They were reproduced full size on 16 feet manila board. Tracings could be made off these and rolled up for convenient storage. Frequently large sheets of alloy metal were used and coated with lacquer. This prevented shrinkage from humidity changes that occurred with manila. These were in effect, the "build sheets of the 1920s and '30s luxury cars. Most have vanished due to the companies going out of business after the war. With mass production companies such as Ford and Chevrolet, the bodies offered during the 1920s and '30s were limited and simple. There was one chassis, one engine and about three bodies in all. Most of the important details for a specific car were noted right on the body itself as it went down the assembly line. The addition of colors other than black required a few notations on the firewall to make sure the right paint was used. After that part was completed, it didn't matter which chassis the body used. They were almost identical. The important technical specs had all been settled long before production started and were stored on blueprints at the engineering department. It was a completely different approach to car building and the twain didn't meet until after the war through the miracle of early computers. We start seeing evidence of build sheets in usage as early as 1950. General Motors retooled their plants after they finished using dressed up 1942 cars to sell after the war ended in 1945. Let's examine a 1951 Buick Special Deluxe build sheet as an example of this post war technology. As you can see, this sheet is about the size of a furnace oil bill, about one third of an 8 1/2 by 11 inch sheet. Age has weathered the paper to a orange and sepia tone hue. The type is simple and mysterious to the uninitiated. This 1951 Buick Special sedan build sheet shows how simple letter and number codes handles the majority of the car's build instructions. Sheets became more complicated as options and styles increased. In essence, what is explained here to the assembly line worker is the build number of the car, S25 at the top. It is followed by 33-11 which is the sales zone and the number of the dealer that ordered the car. In this case, the car was ordered by a Columbus, Ohio dealership. Next in line is Buick 41D DEL 4 DR SED which is a 41 Special Super Deluxe four door sedan. This is confirmed by the body style number 4369D which is a four door post body style with D for Deluxe Trim. Next are the numbers 41 and 09 which stands for paint and trim in this case, gray exterior paint and green interior and carpet. The next line is OPT: which stands for options. What follows are the items installed on this car, A, H, K, O, P and Q. These correspond to: Straight Eight 263 cid engine, Deluxe Steering wheel with horn trim ring, foamtex cushioned seats, Special Deluxe chrome trim, electric antenna. The ACC is short for accessories and is followed by B, D, F, G, L and M. The accessories in this case are heater/defroster, sonomatic radio, safety group consisting of back up lamp, glare proof mirror and parking brake signal lamp, windshield wide angle wipers, safety glass, and accessory group M which included chrome wheel covers, dashboard clock, trunk lamp and licence plate frames. As you can see this was a well-equipped car by 1951 standards. A less optioned car would simply have more empty spaces below the top row. The 1950s delivered war era technology to the assembly line and consumer alike with options galore and a wide variety of color schemes, body styles and drivetrain choices. Higher compression engines with overhead valves, fully automatic transmissions, two and three tone paint finishes and power accessories made assembling cars a lot more difficult. The line workers no longer could rely on memory and a few simple scrawls on a body to get the combination correct. Definite structure and copies of build instructions were needed at several places through the assembly line to keep the car moving along with the right options as ordered by the dealer. With new plant machinery installed after the war, the build sheet emerged to direct assemblymen what equipment went on what cars. To be sure, the old hands were able to do their job with very little reliance on the sheets. Relief workers, trainees and workers from other departments often being groomed for managerial positions, were routinely fed through a large plant as part of the employee's education. For them, the build sheet made it easier to do the job. By the mid-1950s, the sheets were still quite small, the information compact and not easily understood by the outsider. Due to the age of surviving cars and a number of them being restored multiple times, the role and importance of build sheets was not clearly understood. As a result, not many sheets from the 1950s have survived. Let's look at a build sheet from a 1964 Mercury. This style illustrates an older form of sheet dating from 1963. The Comet was a relatively simple car without a lot of options. By 1965 the simple build sheet was giving away to more complex forms designed to handle detailed builds. This 1964 Comet Caliente is one of the earlier formats used on Ford's economy cars. This particular unit is a Comet Caliente so it has more trim and extras which shows us how the build sheet worked to help an assembly line worker. Read from left to right, we start with the body number which was assigned by the plant making bodies for Ford/Mercury. Next is the serial number which tells us it's a two door convertible body with bench seats and left hand drive for the US market. To the right of that is paint and trim code which is dark blue metallic exterior and light blue metallic interior. The engine is next which is a 289, two-barrel V8. We can also learn that it received a 3.80:1 rear axle ratio and was built May 9th 1964. You'll notice this is just the bottom part of a build sheet which was fed through a cog-wheel printing machine. The tear line was just above the body number section which no doubt had the information on the previous car to pass on the assembly line right above it. This sheet was taped to the inside of a door panel from which it could be easily retrieved. The printed section is blurry because the computer was printing in triplicate so they could rapidly be disseminated to various stations across the assembly line. We can see that more substantial cars with a long option list and several body styles are going to demand more information and a larger sheet. The early sixties was the tipping point when manufacturers added new machines and expanded assembly plant operations to expedite building cars. The sheets were revised and made more detailed. The balance between adding enough information for the worker and keeping it simple enough to read at a glance required a short hand code derived from part numbers, suffix codes, machine code and sales option numbers needed to make a complete build sheet. Ford, Chrysler and General Motors had their own special way of doling out the information. We'll look at the codes, the thinking behind the sheet layouts and some sample sheets in part two of History and Evolution of Build Sheets.